Technical communication student Kennedy Harkins and English alumna Ivy McKay ’17 had their research articles published in issue 10.1 of The Pegasus Review: UCF Undergraduate Research Journal. The highly selective journal, which accepts just seven articles per issue, features essays that go through a thorough editing process, with the writers receiving assistance from professors acting as mentors. In her essay “Esther Reed’s Political Sentiments and Rhetoric During the Revolutionary War,” Harkins compares Reed’s broadside, which urged Philadelphia women to campaign for the revolutionary war effort, to another famous, revolutionary-era literary work: Thomas Paine’s “Common Sense.” While the works had similar goals, Harkins notes the difference between Paine’s prominence in the public sphere and Reed’s in the private and the influence this distinction had. 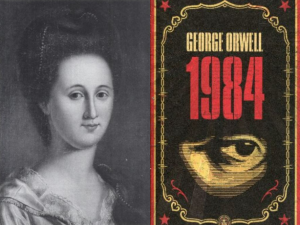 McKay takes a different route in analysis of political rhetoric with her essay, “Donald Trump and Doublespeak: An Unsettling Precursor to the Dystopian Society of George Orwell’s 1984.” In her essay, McKay sheds light on a concerning similarity between Trump’s 2016 presidential campaign and the government in Orwell’s famous dystopian novel “1984.” McKay says Trump’s self-contradictory speak mirrors the use of “doublespeak” by the government known as the Party in “1984.” McKay also discusses the possible effects of the current “Orwellian Party-like” presidential administration on the American people. Click here to read McKay and Harkins’ articles and learn more about The Pegasus Review. Read about more College of Arts and Humanities students who have been published in the journal.